This summer I took an online class about family involvement from a website called Fairy Dust Teaching. In the past we have offered a Parent Collaborative Meeting each month so we would have a chance to chat with parents in a casual setting, discuss upcoming events at the school and brainstorm about concerns they may have. This year we are going to substitute a few of our parent meetings with Family Literacy Nights! Parents and children will be invited to attend and we will offer literacy based activities that parents can do with their children. We are very excited our first Family Literacy Night which is scheduled for October 24th. We are going to have local Danvers author, Paul Czajak, come to our event and read his newly published book Monster Needs a Costume! After Mr. Czajak reads his book, there will be all sorts of monster-themed games and activities for the children to do with their families. Children will be encouraged to wear a costume of their own as the event is scheduled for the week before Halloween. We are very excited to offer this new opportunity for family involvement at our school. Stay tuned at the end of the month as we will post about the details of the event and offer suggestions about how to offer a successful Family Literacy Night based on what we learn! If you are a parent and would like to purchase a copy of the book from Amazon to bring to the event to be signed by the author, click on the picture below. The Fox Hill School receives a commission from Amazon for each sale and the proceeds we earn from the sale of this book will go towards new books for our classrooms! Using just enough glue in our passports! Today we read a great new book called Too Much Glue by Jason Lefebvre. The book is hilarious and it was a perfect introduction to teaching the kids about the the ins and outs of being a responsible gluer! As you can imagine (or have experienced) if the kids use too much glue you have to rescue them from the sea of glue, googly eyes and pom poms and then wait a week before the glue even dries! So we thought we would cut that scenario off at the pass this year and take some time to really explore the proper way to use glue. 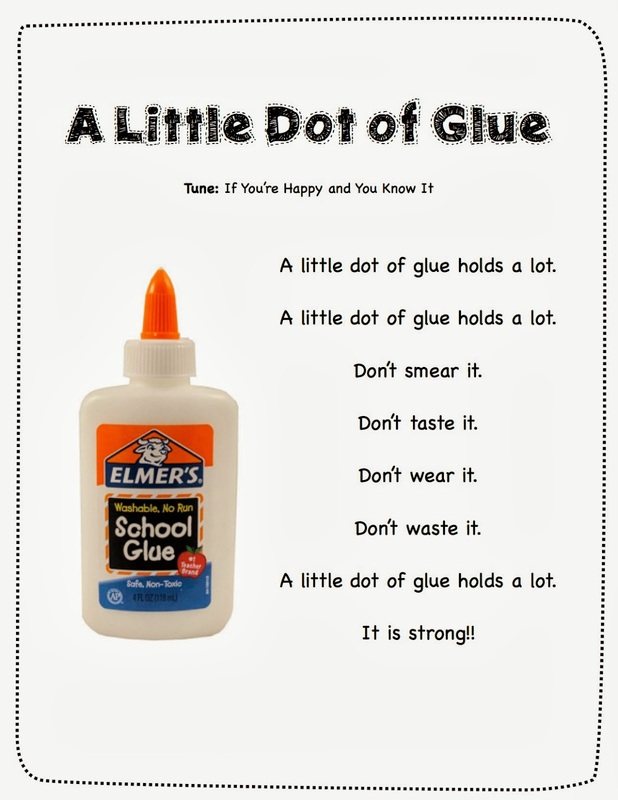 The folks at the Fairy Dust Teaching blog posted a great little song about using glue on their blog that we sang with the kids and they loved it! So we are off to a good start. 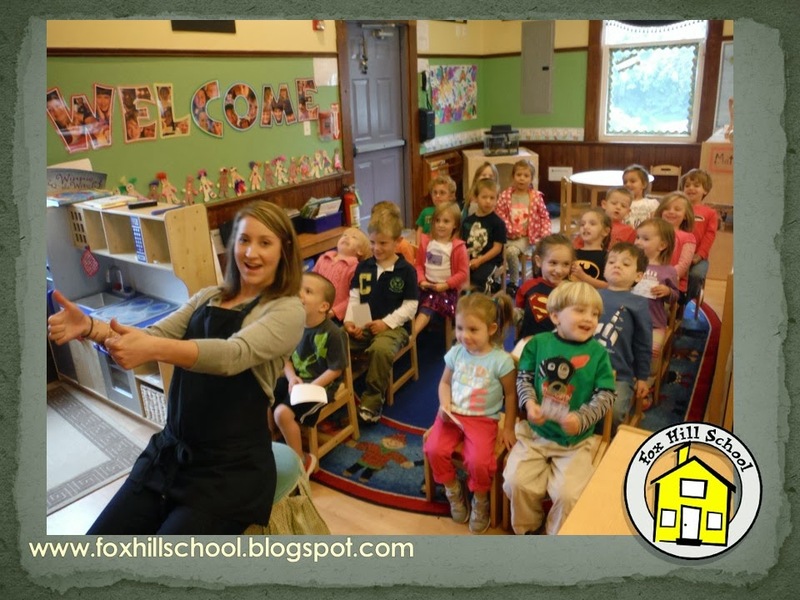 No child sized glue-suits in our future at the Fox Hill School! If you would like to purchase this book from Amazon, click on the picture below! Captain Amy taking off to Australia! ..Don't know when we'll be back again. That's how the song goes and that's what some of the kids thought when we told them we were flying to Australia! "I can't go on a plane without my mom" was my favorite response when we told the kids that we were going on a plane at group time. We have started a year long geography/social studies curriculum using Around the World in 80 Tales by Saviour Pirotta as our focus book. Our first stop - Australia! 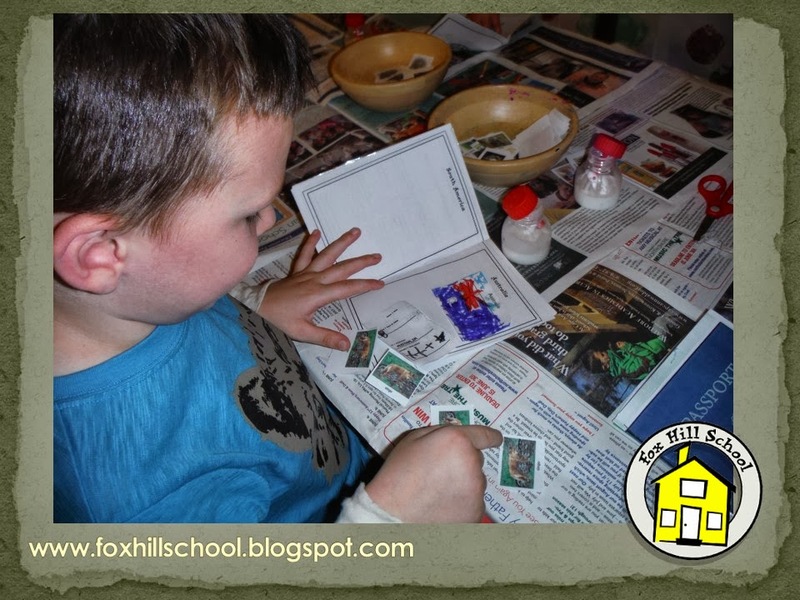 In preparation for our travels, each child traced numbers on small cards that we then used as seat numbers on our plane. The kids also wrote their names on their boarding passes (that we customized to our trip and printed in advance). We lined up chairs on the group time rug in rows to make our "airplane" and the kids boarded the plane, giving the flight attendant their boarding pass and looking for their seat numbers. Once everyone had boarded we buckled up and prepared for take off! (Look at the kids' faces as they lean back during take-off. So fun!) Our in-flight entertainment was reading one of the Australian tales from our focus book. As we prepared for landing we showed the kids where Australia is on the map and made our descent down under! A successful first flight to kick off our new study of the world! As we are starting our year, we are introducing all of the daily activities that we do with the kids to help reinforce important concepts. This year we have added a new one that I just love! I took an online course from Fairy Dust Teaching this summer and the instructor is a Kindergarten teacher in the mid-west who works at a Reggio inspired school. 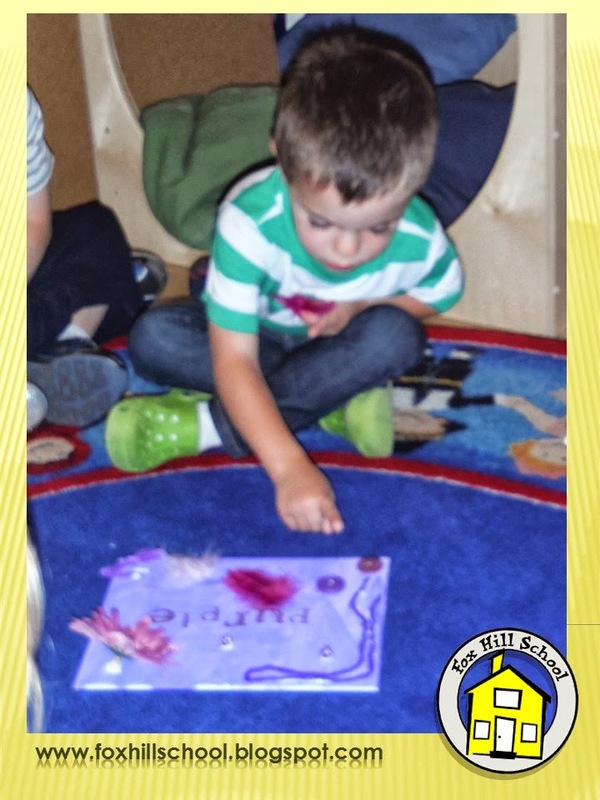 The Reggio approach is child-centered which makes for some amazing learning. So one of the new ideas that we are going to implement this year is having the kids create a color-of -the-month canvas each month. 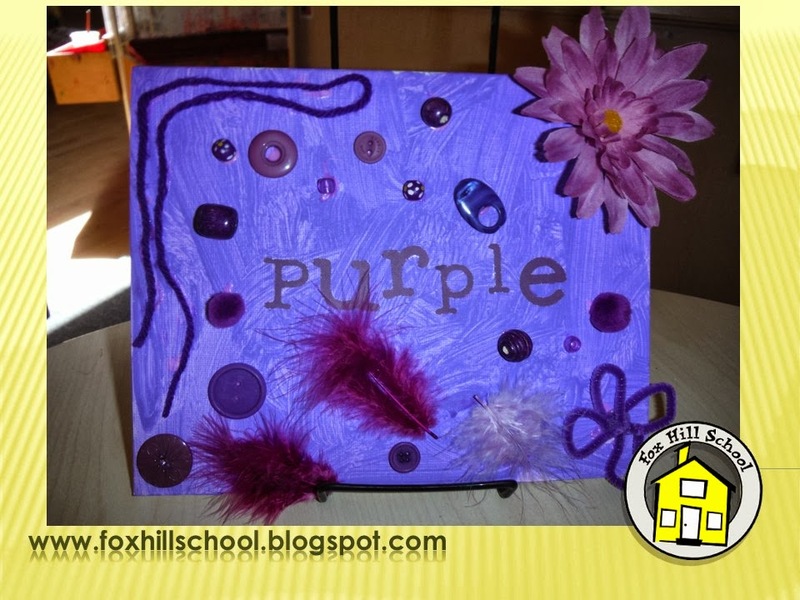 This month our color is purple so first we had the children paint a canvas purple. When it was dry we added the word "purple" and brought it to group time. We discussed the color purple, how you can make purple and that there can be many different shades of purple. Then we put all sorts of collage objects in a mystery bag. As we went around the circle, kids chose an object from the mystery bag and decided if it was purple or not. If it was purple, they glued it to our purple canvas. Each month we will display the children's color canvas in the classroom. It is important to have child created art in the classroom and this is a display that we will be able to add to each month! The kids loved it and the canvases will be a great addition to our classrooms! Fall is Here - It's Pumpkin Time! There is nothing better than fall in New England. Among my favorite fall activities is visiting the apple orchard/pumpkin farm. 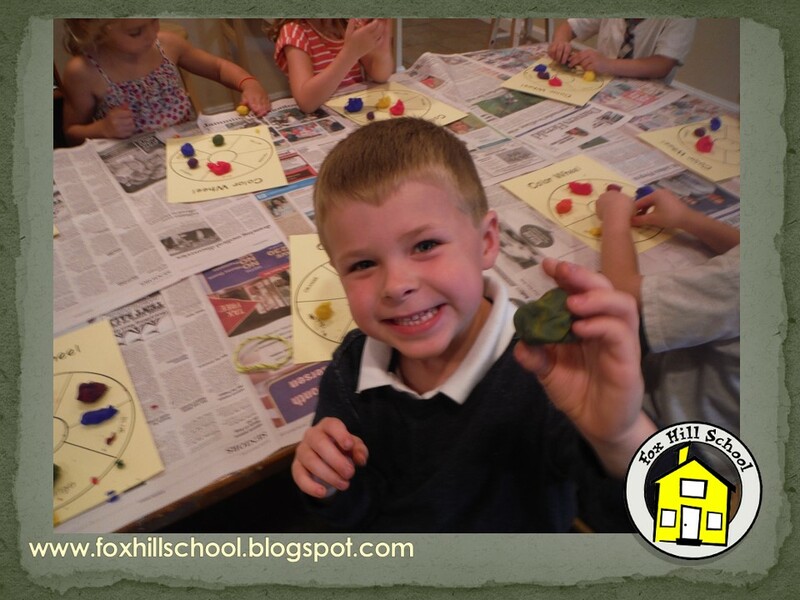 Although this activity can be a fun school field trip, as a parent, I love doing this activity with my children so we like to offer this activity as a Family Fun Event with the school. We plan a day and time for families to meet at the orchard and whoever wants to go can meet us there! It gives families a fun activity to do with other families from the school - great for meeting new friends at the beginning of a school year. 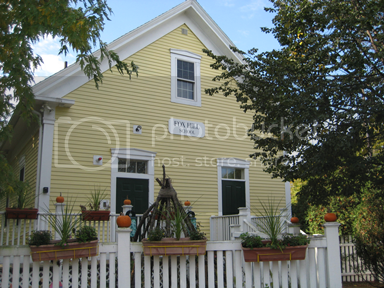 Stay tuned for all kinds of apple and pumpkin activity ideas that we are doing at the Fox Hill School this fall. 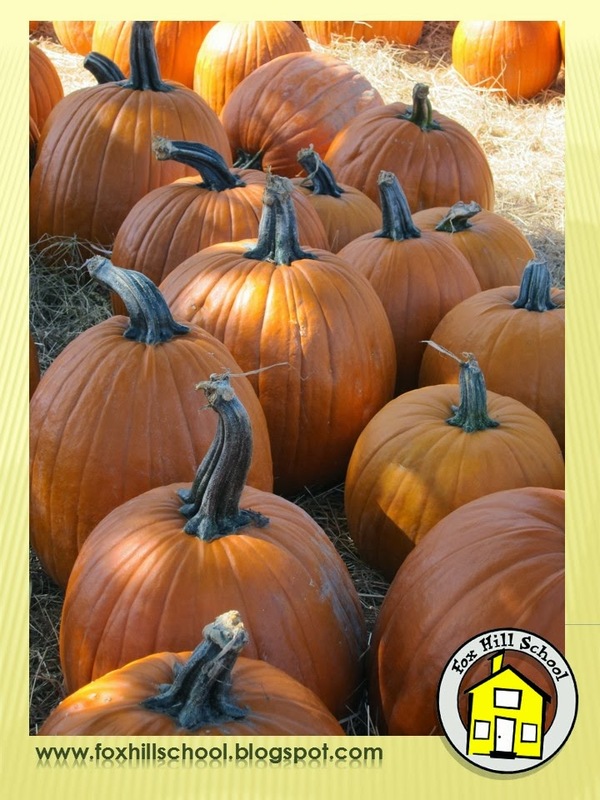 If you are a preschool or Kindergarten teacher looking for a great pumpkin literature-based curriculum guide, be sure to check out our guide at our Teachers Pay Teachers store! Looking for some wonderful books about pumpkins? Click on the pictures below to purchase these titles from Amazon! what colors they would make. The template suggested during my class had more than just the primary and secondary colors but I thought that would be too much for my little artists. So I simplified the template to only have 6 colors and it worked great! 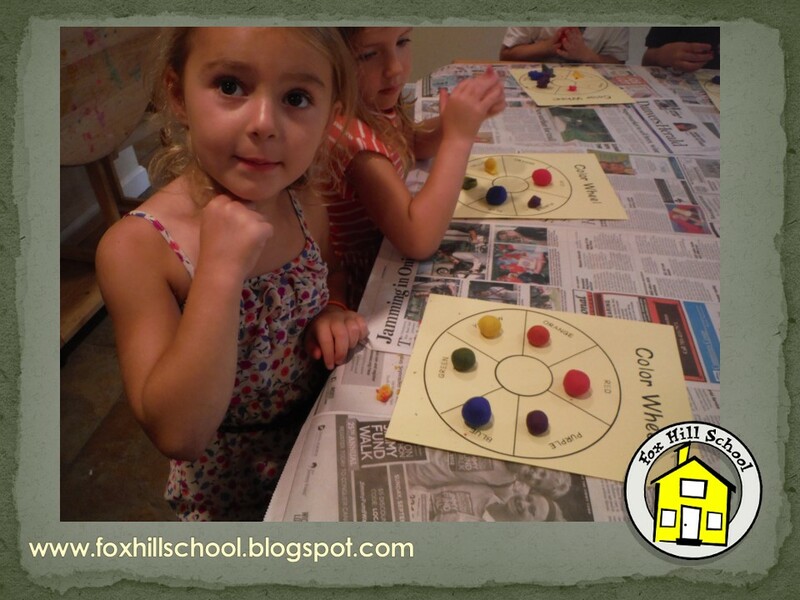 My template also had a big circle in the center (not for any particular reason) and the kids thought that they should mix all the colors together, see what color it made, and put that ball of play dough in the middle. I hadn't thought of that but it was fun and informative so we did it! This turned out to be a great way to start our year in Art. They will know how to make the colors they want for future projects, they loved the "magic" of mixing the play dough and it was so fun it got them all talking to each other and getting to know their new classmates. Great first day of Art! Here are a few fun stories that are fun to read at the beginning of the year in Art class. Click on the picture below to purchase from Amazon! You know how it is when one child chooses a crayon from the big basket of crayons and all of a sudden EVERYONE wants the same crayon?!?! I don't claim to know why this phenomenon happens but I may have found an easy, inexpensive solution. I found these adorable, durable buckets at A.C. Moore for $1.50. Then I affixed Martha Stewart Chalkboard Sticker Labels (I bought them at Staples but I've included a link to the same ones on Amazon). Then I wrote each of my students names on their own bucket of crayons with chalk (I only have 11 Kindergarten students). Over the summer I was able to purchase 24-packs of crayons for 50 cents and the 24-pack fits perfectly into the bucket. Now they each have their own bucket of crayons! Everyone can use the same color at the same time and they have responsibility for taking care of their materials. A fun and simple solution! As we were deciding on a focus book to start our school year, we came across a book called Fill a Bucket - A Guide to Daily Happiness for Young Children. This is a sweet story that lets us know that every person is born with an invisible bucket. When their bucket is full, we feel happy. When our bucket is empty, we feel sad. You can fill your bucket (or someone else's bucket) by being nice to them, making them smile, or helping them out. If you do nice things to fill someone else's bucket, your bucket gets filled too! We thought teaching the children the importance of being a good friend, son, daughter, brother or sister would be a great way to start off the school year. 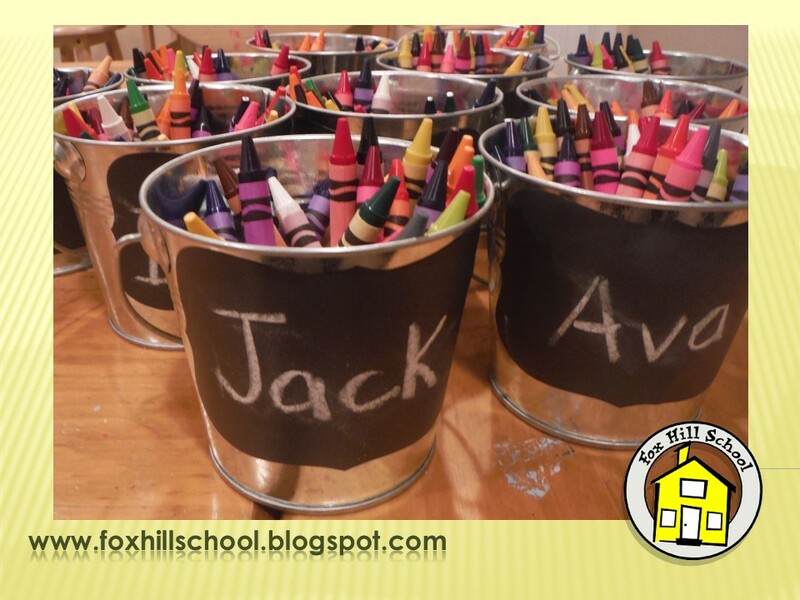 Because the "invisible bucket" concept can be a little vague for young preschoolers, we gave each child an actual bucket with their name and picture on it. We realized just how vague the concept could be at orientation when we read the story aloud and I asked who could tell me something they could do to fill their friend's bucket and someone said "get some dirt and water to make mud!" So we will need to review this concept a few more times! 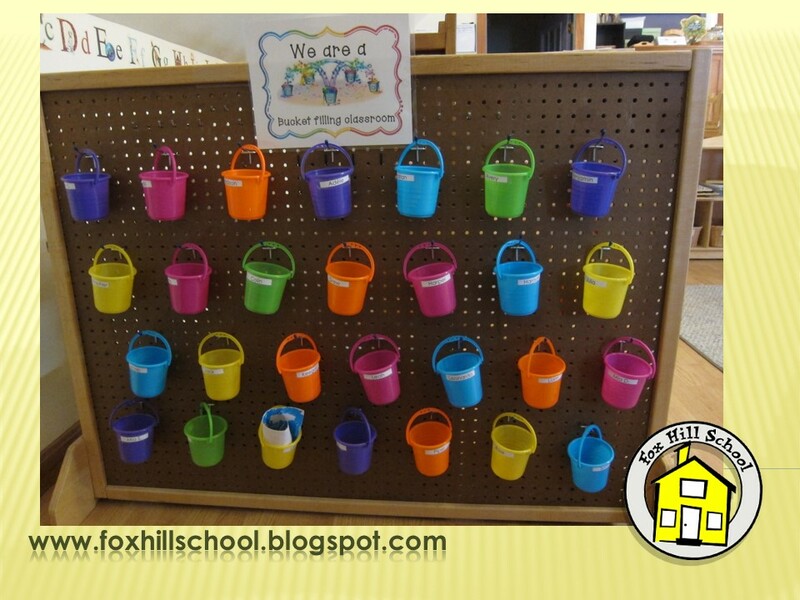 I found this poster on Pinterest to display in the bucket area. To start the activity we asked parents to write a note or draw a picture during our back-to-school orientation and leave it in their child's bucket so the kids would find it on the first day of school. During our first week of school we explained to the kids they can draw pictures or write notes to their friends and leave them in their buckets any time. Making a note for their friends will not only fill their friends' bucket, but their own bucket too!